On 25th February, our in-house Nutritionist visited Anglesey Academy in Burton upon Trent to deliver healthy eating assemblies. These assemblies aim to empower children of all ages to try healthy foods, stay active and enjoy a balanced lifestyle. Unusual and exotic fruits were brought into the school for the children to see, touch and smell as we explained the facts about each fruit. Students were then transformed into expert taste testers by giving their opinions with a thumb up if they like it, thumb to the side if they are not sure and a thumb down if they don’t like it. We also brought with us our innovative Smoothie Bike, where pupils used their own pedal power to make a delicious smoothie using a variety of fruits and vegetables. 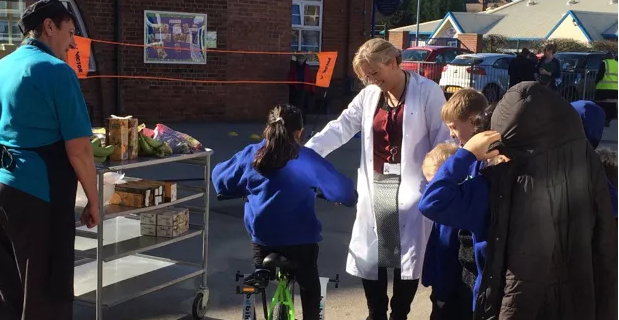 Emma Hookham, Public Health Nutritionist, said: “The smoothie bike is a great way to get pupils talking about the importance of exercise and where food comes from”.